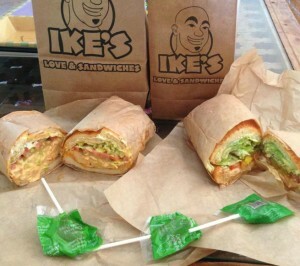 If you love sandwiches as much as our family, you have got to try Ike’s Place! There are 12 locations all around the Bay Area. Ike’s is a retro sandwich shop that typically has long lines during the lunch rush. Our family goes to the Santa Clara location, right next to the Santa Clara University campus. Ike’s gets their gluten free rolls from Mariposa Bakery in Oakland, CA. These baguettes make the sandwiches amazing! One thing to note is that they often sell out of the Mariposa rolls before the next order comes in. If that happens, they use regular gluten free bread, but it is the heavy rice bread and is not as good as the rolls. I always ask when placing my order to make sure they still have the rolls. This is the sandwich order board. Most of these sandwiches can be made gluten free. Ike’s takes precautions very seriously. They make the sandwiches on paper liners. They make sandwiches in a separate area of the store. At the Santa Clara location they use a counter across from where they make regular sandwiches. They put on clean gloves to make your sandwich. They use a clean knife to cut the sandwich. If you get a hot sandwich, the meat is warmed in the microwave on a liner as well. Ike’s special sauce is also gluten free! If you need dairy free as well, you can omit the cheeses. Yes, this incredible sandwich is gluten free! Our favorite sandwich combinations so far are the SF Giants, Hollywood’s SF Cheesesteak, and Matt Cain. As if the sandwiches are not tasty enough, you get a signature caramel apple lollypop with your order! Great for anyone except my daughter who has braces :-). Omg thank you for the awesome review on Ikes! I had heard that they have GF bread but I was scared of the cross-contamination issues! But it sounds like they have it down and I can’t believe they use Mariposa rolls, def going to get one very soon!